Working with startups focused on smart, rapid growth is something we love. In this case, we were able to work with a motivated, focused team who had an understanding of the value of paid search. They needed someone to keep up with them, effectively running these campaigns and fill their sales funnel while the management team focused on scaling and managing locations. We proved to be up to the challenge. Working closely with their internal marketing team, we not only helped set up and scale effective paid search campaigns, but were integral in helping test and analyze the success and profitability of different marketing tactics. Whether they were opening new locations or acquiring competitors, we were able to respond quickly and effectively, setting up new campaigns that performed well and aligned with the brand. Over the course of two years, we oversaw a 5 fold increase in spend, a tripling of locations, a cost/conversion decrease of 43%, and a value/lead increase of 18%. Our client was rapidly growing (image 1), opening 1-2 locations every month and in the midst of acquiring multiple locations from a competitor. They were running paid search campaigns internally, but it was not their expertise and their rapid growth had left them with less and less time to devote to paid search. They brought us in to spearhead their paid search program and accommodate their growth and acquisitions. Since it was a major source of their leads, it was vital these campaigns be managed successfully and easily scale with their growth. Our goal was to establish a comprehensive strategy across location and service areas, engage in landing page and promotion testing to drive results, and employ analytics to better understand the value of different conversions. This quantitative-based approach, focusing on value rather than just leads, would allow us to drive real value for our clients. Using data from all the locations, we pooled keywords and results to build a more robust campaign strategy (image 2), building out an extensive list of keywords while also employing a comprehensive set of negatives. While lead generation is the primary goal, revenues and profits were the ultimate goal. The actual lead was just one important step along the funnel (image 3). We wanted to track users from the initial goal completion through to final sales and revenue numbers. 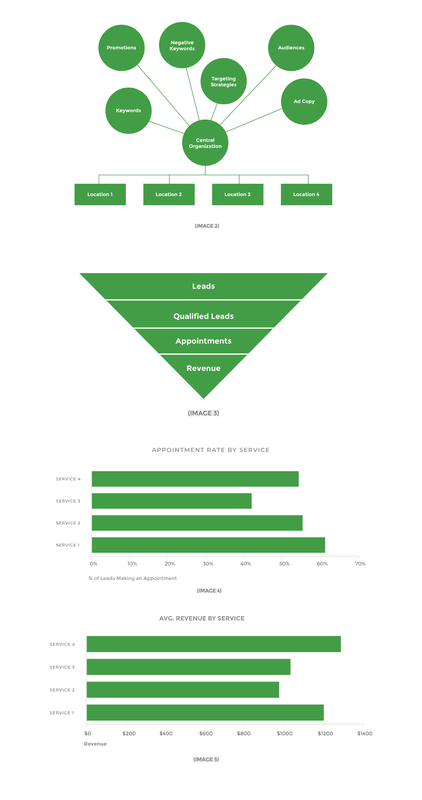 Not all leads are created equal, and using CRM data as effectively as possible to concentrate on the real value of users would mean better results for our clients (image 4 & 5). Our setup allowed us to gather and analyze data despite frequent changes to promotions and data spanning dozens of campaigns. We tested multiple promotions and price points (image 6) for the client to determine the effectiveness of each, aggregating data when advantageous to help make better marketing decisions. Data segmentation also allowed us to better measure performance across locations and service areas (image 7 & 8). San Francisco is a lot more competitive and expensive than Madison. While that’s not a newsflash to anyone, we were able to quantify the differences and set performance expectations accurately. This lead to better projections when it came to scaling or constricting campaigns or launching new product areas. Another benefit of our well-organized account structure was fast and efficient launches for new locations. Built with learnings from the account as a whole, we were able to push new campaigns and locations out quickly and already optimized for immediate performance. Paid search became their primary marketing tactic when launching into new areas. We also helped to integrate their CRM with their paid search programs, giving us the ability to download data and compare results along the entire marketing funnel. It wasn’t just about leads. 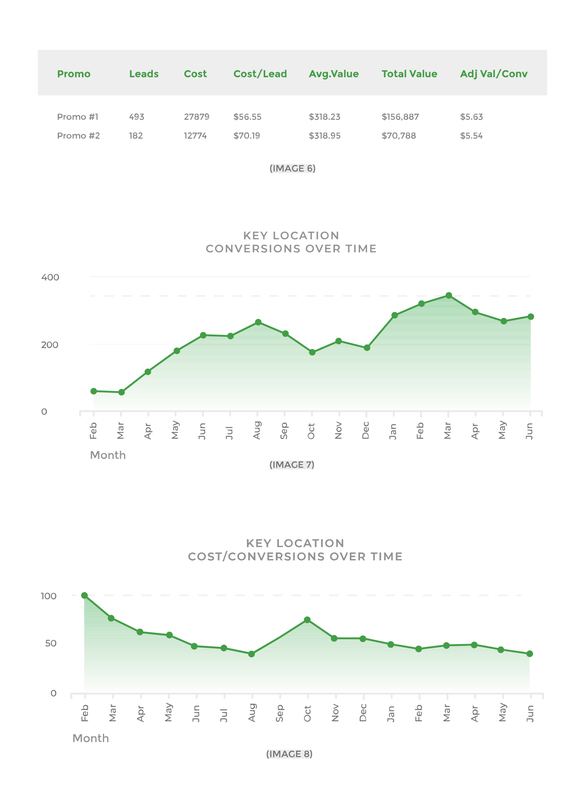 We tracked visits, to leads, to MQLs, to SQLs, to appointments set, to appointments kept, to sales, to revenue. This funnel applied across marketing tactics, promotions, and locations, allowing us to do statistical analysis on the true value of each of these variables. When we began working with the client, they were spending $46k/month across 14 locations. Less than two years later, they were spending over $250k/month across 42 locations. Cost/conversion started at $101.08. In the end, cost/conversion was $55.29, saving 45.3% from the initial performance. 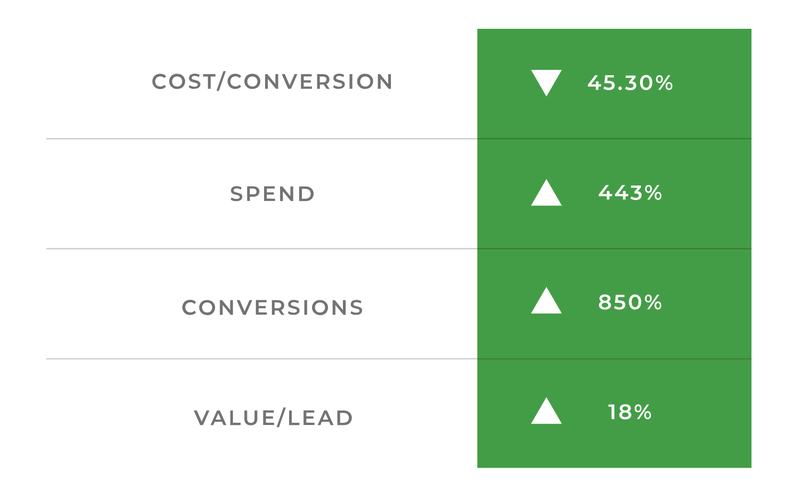 Conversions were up 850% on a scaled spend up 443%. 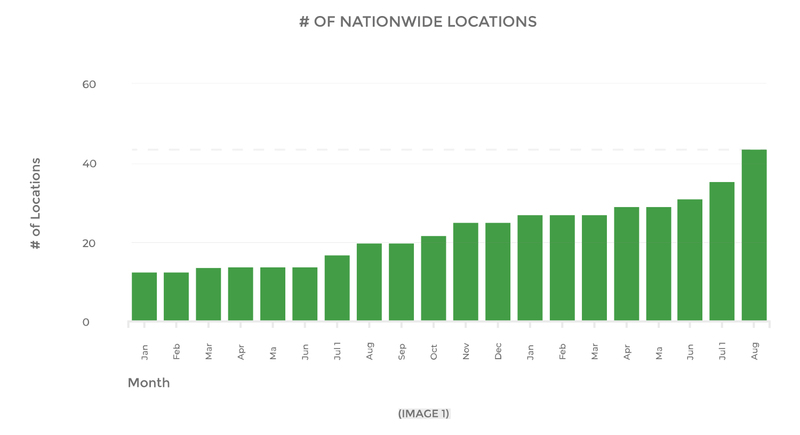 Value/lead, when normalized for location, was up 18%. Of the course of two years, we ran multiple large-scale tests on price points and promotions. We helped the client test different sales approaches, measuring not only results via paid search but analyzing the entire funnel to help grow their business. Through A/B testing and the effective use of data, we were able to successfully support their business as they scaled. How Important Is Click-Through-Rate (CTR), Really?